Hybrid of adventure and puzzle game in which we play Sir Albert Wickes and Clarence Baxter - inventors trying to reach Mars on board of a steam spacecraft. In 39 Days to Mars you can play alone or in a two-person cooperation on a shared screen. 39 Days to Mars is an adventure game with clearly outlined elements of the logical game, filled to the brim with specific British humour. The production was developed by an independent studio It's Anecdotal. 39 Days to Mars takes us on a journey to the alternative 19th century steampunk version, 1876 to be precise. The main characters of the game are Sir Albert Wickes and Clarence Baxter, inventors, who on board HMS Fearful, a steam spacecraft, make a virgin journey to Mars. However, things don't go their way, which means that they have to face various problems during the interplanetary expedition. In 39 Days to Mars the action was shown from the side. In the course of the game we take control of the heroes, who have to cope with the next challenges without interruption. The ship's components break down in the least expected moments, the map on board tears the cat's map into pieces and the coal finishes too quickly; as if that wasn't enough, our guests must find time to brew tasty tea in all this crushing. Running on board the HMS Fearful we solve various riddles (consisting both in manipulating the devices installed on the ship and in more prosaic activities like the above mentioned tea brewing), helping the protagonists to reach their destination. 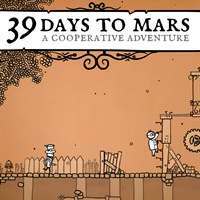 39 Days to Mars is designed for cooperation on split screen. The production also allows you to play alone in Albert's shoes. 39 Days to Mars has simple, hand drawn graphics. The gameplay is accompanied by catchy music played on the piano.